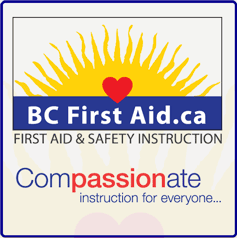 This is the best first aid course I�ve taken in 30 years of taking first aid"
BC First Aid provides first aid and CPR instruction on the Sunshine Coast, BC Canada. We cater to individuals who require first aid certification for their workplace and/or volunteer group. Our First Aid training center also offers instruction to interested members of the general public. In addition to First Aid, we also offer First Aid Kits and the Pleasure Craft Operator Competency (PCOC) training and certification. BC First Aid training programs include practical hands-on training delivered by certified instructors. The curriculum used has been developed by experts from well established organizations such as the Canadian Red Cross, and The Canadian Lifesaving Society. It is recognized both locally and internationally. The training combines the use of multi-media with practical hands-on, self-study and traditional instruction. In the only dedicated purpose-built energy efficient training center on the Sunshine Coast.